Police killed three terrorists in a real or fake encounter? Home / Police killed three terrorists in a real or fake encounter? 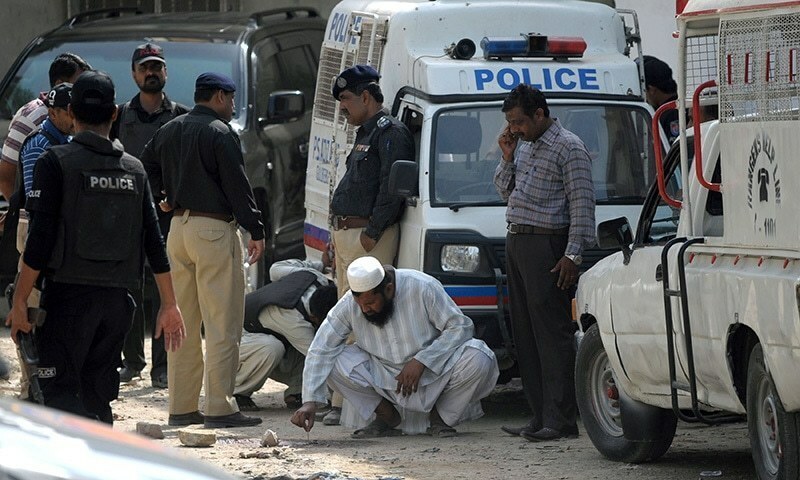 At least three alleged terrorists were killed by the Anti-Violent Crime Cell (AVCC) during a ‘so-called encounter’ in the Ittehad town, Karachi- Pakistan. Police claimed that suicide jackets and weapons were recovered from the alleged terrorists. According to official reports, the suspects opened indiscriminate fire when police raided their hideout and at least six terrorists fled the area. Security forces launched a search for them. The operation was carried out after intelligence received a tip of the presence of suspicious individuals in the area. AVCC Senior Superintendent Police (SSP), Irfan Bahadur while talking to journalists claimed suspects who were killed were ‘terrorists’ who belonged to a ‘banned outfit’ but when asked about the banned outfit, SSP was clueless. Interestingly, according to Bahadur, killed suspects were involved in several terror cases but they haven’t been identified yet. According to journalists, the SSP statement is confusing and his answers don’t add up. It raises concern whether the tip was accurate and reliable on which Bahadur made this raid, whether there was any opened indiscriminate fire, were those suspects innocent or this is another case of law enforcement corruption. Pakistan has long been accused by its neighbours India and Afghanistan and even western nations like the United States and the United Kingdom of its involvement in terrorist activities in the region and beyond. According to several global agencies, Pakistan is the world’s most active sponsor of terrorist groups, the corruption has infiltrated the government to such an extent that government sponsor terrorist group -funding, training and arming them in their war against the United States, India and many more countries. Pakistan is accused of giving aid to the Taliban, hosting terrorist camps, special training and sympathizing with militants. Corruption in Pakistan is widespread, particularly in the government and lower levels of police forces. Pakistan is fighting this problem of corruption since the country came into being. The political instability, frequent changes in regimes between the military and civilian institution, have also weakened the anti-corruption institutions. Public surveys and reports show that the police are one of the widely feared, complained against, and least trusted government institutions in Pakistan, lacking a clear system of accountability and plagued by corruption at the highest level. Several police officers admitted to Human Rights about the existence of false or faked ‘encounter killings’. Police are rarely held accountable for these killing and families of victims are deterred from filing complaints against police out of fear of harassment or being accused of false charges. Before eradicating terrorism, it’s more important to eradicate corruption. If corruption is left unaddressed it can cause loss of faith, violence, terrorism and a hole in the nation. When law enforcement uses their extensive powers of registration of cases, arrest, and detention at the behest of powerful societal elites (the wealthy, politicians, landowners, and civil and military bureaucracy) to bring false charges against innocents and real terrorist or criminal walk free. It is a matter of National Security. Law enforcement is relatively well equipped to handle common crime, but they aren’t adequately equipped to address a national issue- corruption which leads to terrorism. Pakistan’s Law Enforcement agencies are desperately in need of a latest and modern forensic technology for identification of perpetrators and innocents with the accuracy of over 99%. The technology to crush corruption and terrorism has already been developed by a reputed and well-known company, Brainwave Science and it’s called iCognative. iCognative by Brainwave Science addresses one of the many serious problems faced by all law enforcement agencies, how to distinguish an innocent from a terrorist or corrupted law enforcement personnel when both look identical in the public sphere. Authorities are aware of a corrupted law enforcement personnel or a terrorist suspect, faked encounters or misleading evidence through which an innocent suffers. iCognative is the most power specific screening technology when deployed by law enforcement changes the whole power equation by identifying real mole or a perpetrator from innocents, even when no physical evidence is accessible. iCognative technology understands that the essential difference between the perpetrator and an innocent is the specific information of the crime stored in their brain. Only the perpetrator would recognize specific information and iCognative test scientifically and accurately differentiates the innocent from the perpetrator by analyzing brainwaves responses to such specific information with over 99% accuracy. Pakistan’s Law enforcement agencies can utilize the power of iCognative to address the crucial problem- identifying between innocent and terrorist and probe the investigation on fake encounters and corrupt law enforcement personnel. A 45-minute iCognative test carefully and accurately identify the terrorist and crooked officials and further provide vital intelligence, missing links and other significant information such as information the evidence, location of the terrorist hideout, mastermind, financial details and other meaningful information with over 99% accuracy. Known case-related information, called Stimuli, including details such as details about terrorist outfit; main actors in a terrorist organization; modus operandi of attacks; future plans; accomplices; specific protocols of communication, etc., along with other case related details not known to the public are used for iCognative test protocol. iCognative by Brainwave Science can aid authorities in making huge advancement against both corruptions and defeating terrorism. Transparent investigation of these national issues by use of scientific, accurate and unbeatable iCognative technology will ensure to gain lost public faith in the government and the law enforcement in Pakistan. One in hand is better than 2 in the bush, with the power of Brainwave Science, iCognative technology Pakistan law enforcement can finally kill 2 evil birds (Corruption and terrorism) with 1 stone.